We have been doing lots of indoor growing recently and planted some beans at the same time that we grew our cress letters last month. This is a really easy, visual way to teach children about root systems and is something I used to do with my school children each Spring time. Plus it’s very exciting to watch how FAST the plants grow! 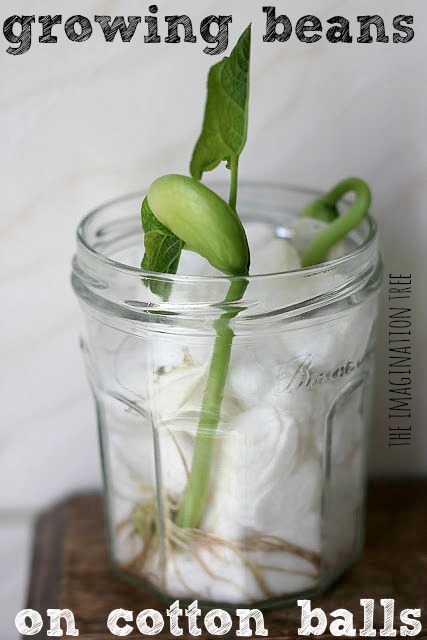 All you need for this easy activity is a glass jar or bottle, some cotton wool balls/ wads and a bean! 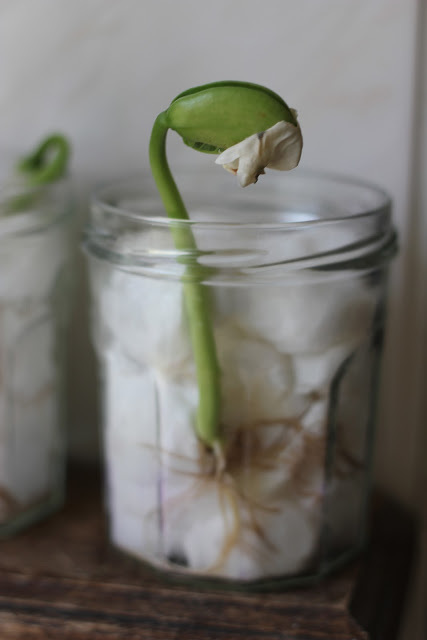 Next, she watered it until the cotton wool was damp but not too wet, and placed the jar in the window. 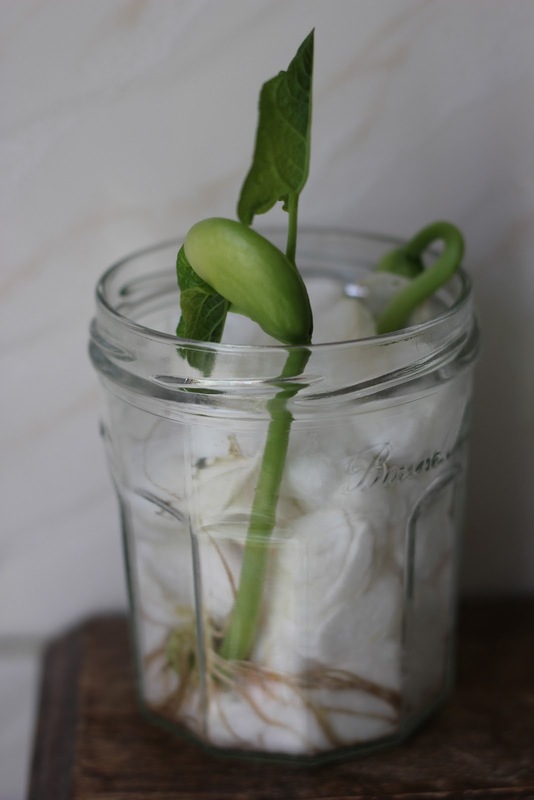 Within 2-3 days the bean started to sprout a small root, and 2-3 days later it grew these little tendrils. Another 4-5 days and the bean developed a large network of shoots coming off the main root, and a sturdy stem grew straight upwards and above the top of the cotton wool. It dropped the shrivelled husk of the bean skin and looked ready to open up! Just a day or so later and 2 big, dark green leaves began to unfurl. Cakie was very excited by this development! 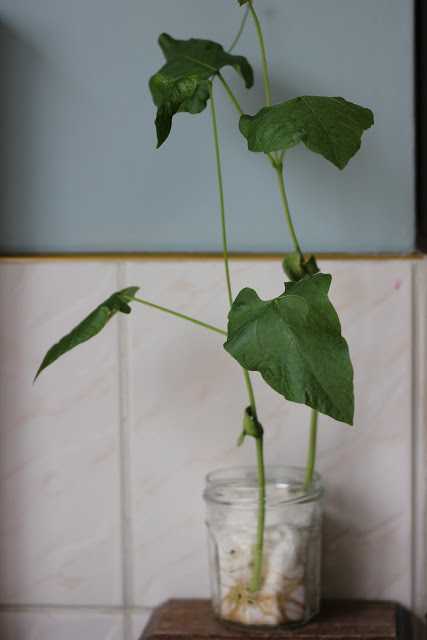 And finally, 4-5 days later the beans were growing very steadily, tall and spindly with large leaves seeking out more sunlight. We carefully removed them from the jar and examined the complex network of roots that had, by this time, entangled themselves around the cotton wool balls at the bottom. 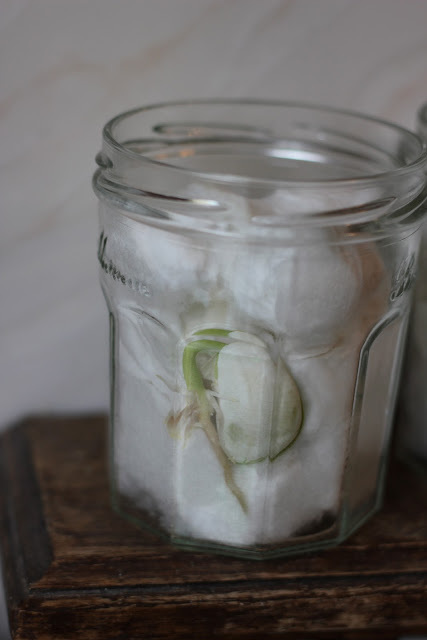 We teased the roots off the cotton wool and replanted the beans into soil in pots in the garden. The girls watered them and are now watching their rapid growth outside with much excitement! Older children could measure the beans each day and record their growth progress in a “bean diary.” They can draw a picture of what the plant looks like every 3-4 days, add a measurement and label the diagram with the parts of the plant as they develop. Alternatively, they could record using a digital camera and printing and sticking in their own photos. Do you remember doing this at school or at home when you were little? Fantastic photos of this loved activity! This is great isn’t it we have some growing at the moment too! Do you need to use a special type of dried bean or will any old bean do? Wow this is impressive! I remember this from my primary school days, we used toilet tissue I think, sadly my tree never sprouted that well, lol. 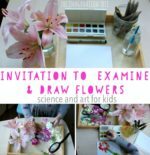 Fantastic post, I’m going to do this tomorrow with The Boy as we’ve been growing seeds but I’d like him to understand the root system and how the plant comes out of the seed. Can you use any bean? Like, for exampel.. uh.. macadamias? peanuts? or do they have to be really dry and all? Macadamias and Peanuts are not beans, they are nuts. You can use most dried beans though. Actually, a peanut isn’t a nut, it is a legume. You can do this with a raw peanut. Just remove from the shell. It’s a butter bean. I did write it in the post but I should edit and make it more obvious as a few people have asked! 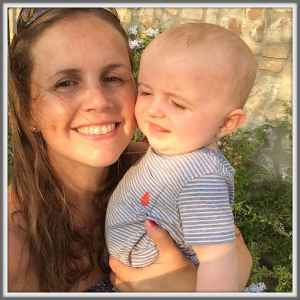 Thanks for sweet words about the blog! what type of bean is this? is it normal for the beans to start smelling? 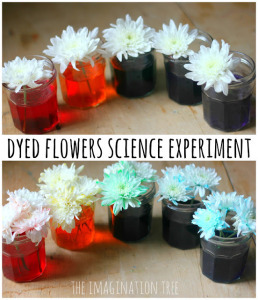 Do these attract fruit flies? Thanks. 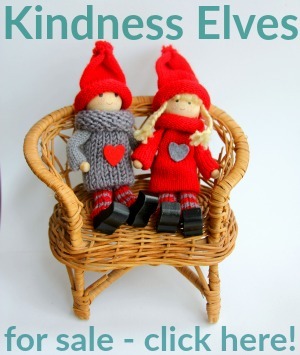 Lovely project. amusement account it. Glance complicated to far introduced agreeable from you! to find this topic to be really one thing that I believe I’d never understand. It seems too complicated and extremely broad for me. I am looking ahead for your subsequent publish, I will try to get the dangle of it! Hi to every single one, it’s really a good for me to pay a visit this site, it includes useful Information. Aw, this was a really good post. Taking a few minutes and actual effort to create a really good article… but what can I say… I procrastinate a lot and never manage to get anything done. Hi there it’s me, I am also visiting this web site regularly, this web page is genuinely fastidious and the visitors are genuinely sharing nice thoughts. I’m now not positive whether this submit is written by means of him as no one else recognise such exact approximately my problem. You’re amazing! I’ve learn several excellent stuff here. Definitely price bookmarking for revisiting. I surprise how much attempt you put to make such a excellent informative website. a blog then i suggest him/her to go to see this webpage, Keep up the good job. Nice post. I was checking constantly this blog and I’m impressed! Extremely helpful information specially the last part 🙂 I care for such information much. I was looking for this particular information for a very long time. Thank you and good luck. Your article has truly peaked my interest. I will bookmark your site and keep checking for new details about once per week. I had a question about the cotton you used. 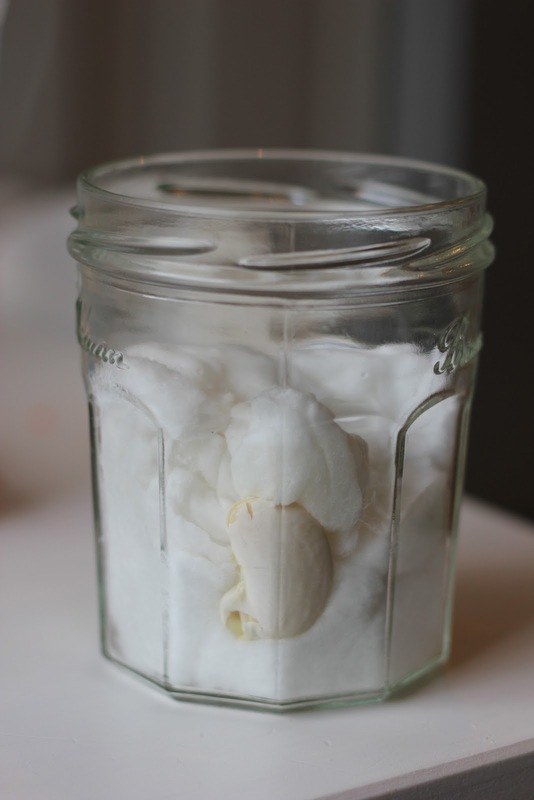 Does it have to be cotton wool or could you use plain old cotton balls? Thank you!